It seems like every time I log on to one of my social media accounts, someone is announcing a pregnancy or birth. Perhaps this is why I’ve recently written on the supposed “gender-wage gap” and mandated paid maternity leave. One thing that keeps popping up among my pregnant friends is the question of whether to have a midwife deliver their baby at home or in a birth center, or seek the medical care of a doctor in a hospital when the time comes to deliver their little ones. For most of my friends, the choice is a doctor. For a few, however, the choice is midwife or bust. My friend group appears to follow the typical statistics for birth in the United States. Of the approximately 4 million babies born annually in the U.S. (holy procreation, Batman! ), about 99 percent of them take place in hospitals. The other one percent of births, however, occur outside of the hospital. While cases documented by TV shows like TLC’s “I Didn’t Know I was Pregnant” account for some of these births (yes, this is a real thing, and no, I don’t know how this happens either), many of these “more primitive” births are completely intentional. In fact, one recently launched TV show titled, “Born in the Wild,” documents women who choose to give birth to their children out in the woods. This got me thinking. One percent of 4 million isn’t trivial—it’s still 40,000 babies annually. What’s more interesting is that this number used to be much higher—and not that long ago. In fact, Jimmy Carter was first U.S. President to be born in a hospital. In 1900, nearly all births occurred outside a hospital according to the Centers for Disease Control and Prevention. By 1970, the number of out-of-hospital births had fallen to one percent. So what happened to home births and midwives? The most straightforward argument is that, as medical technology improved, midwives were replaced by more qualified, safer doctors. But that may not be all to the story. In fact, like so many other stories told on this blog and elsewhere, the disappearance of the midwife from childbirth appears to be the product of special interest groups and regulatory capture. In the late 1800s physicians began to form an organized special interest group. At first, doctors marketed their labor and delivery services to wealthier, upper and middle-class families. Midwifery continued to be the default option for poorer women. But like other special interest groups, doctors worked in conjunction with political actors to pass a variety of laws that argued midwives were uneducated and unsafe. Regulations like the Sheppard-Towner Maternity and Infancy Protection Act of 1921, combined with heavily regulated training and licensure programs, contributed to a sharp decline in the use of midwives throughout the U.S. Despite their historical use, midwives are now allowed to practice in varying degrees in only 27 states. In 23 states, midwives are banned outright. Despite the rhetoric that midwives are inferior to doctors in regard to childbirth, this doesn’t seem to be the case—when it comes to normal-risk pregnancies. In fact, infant mortality risk for such births is practically indistinguishable between home births and hospital births. Home births also offer other possible benefits. Home births and births involving a midwife are much less likely to result in C-sections. Though common, such procedures put both mother and baby at risk. Women undergoing C-sections are more likely to experience infection, hemorrhaging, and take longer to recovery from delivery. Maternal mortality for babies born this way is also higher than it is for vaginal births. Babies delivered by C-section are more likely to have breathing problems, sustain an injury due to the procedure, and have lower APGAR scores (a test given to evaluate the health of newborns). 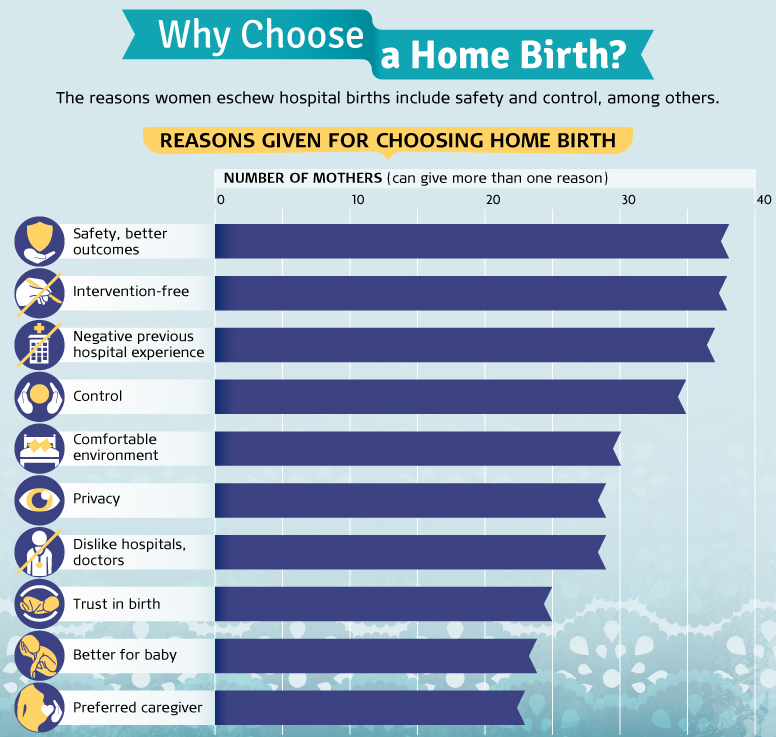 When asked why they selected a midwife and home birth over a hospital and doctor, women give numerous reasons. Most cite the aforementioned safety of home births and the decreased likelihood of C-sections and other medical interventions. Others stated they felt the former option offered more control over the experience, occurred in a more comfortable environment, and that they preferred their particular caregiver. Ultimately, whether a child is brought into this world with the assistance of a midwife, doctor, etc. should be about choice—the parents’ choice. Unless someone presents significant evidence that midwives and other alternative birth environments produce systematic neglect or abuse, there is no objective reason why such practices should be more regulated than doctors, much less banned. The fact is, the government has no place in the bedroom, or the delivery room. Hospital births and home births have different risks and benefits. Women and families, not special interests and government bureaucrats, should be able to weigh the pros and cons of these options and make a decision based on their personal convictions and circumstances.